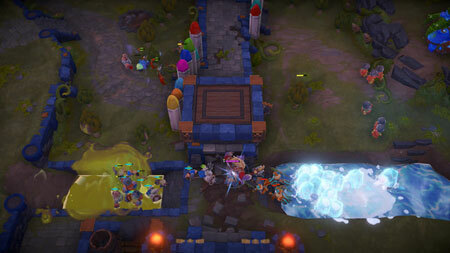 MINImax Tinyverse is a real-time strategy brawler by O’olBlue Inc. Take part in 1v1 battles between armies of tiny little beings. Each army is led by a powerful champion with unique skills and attributes, and supported by a wide range of troopers who fight alongside you and your Champion. Choose between Aillai and Creaea, the two Realms of the Tinyverse and assist your forces to defeat the enemy’s army. Facilitate the advance of your allies by building a ramp or destroying walls, trees and other obstacles, or dynamically change the playing field to stop your enemies march by building a crayon wall and setting it on fire, or by freezing, polluting or electrifying the water. MINImax is a medieval-looking antique shop in a small town whose name people cannot recall. The existence of a very tiny universe has been hidden for millennia. Few have reached the Tinyverse before, but both Aillai and Creaea have learned the advantage of The Big Ones watching and helping them in their battles. The champions and leaders of both sides are waiting for you to put an end to this confrontation once and for all. If you get stuck in the game, check out the video walkthrough and gameplay for the game. This entry was posted in PC Games, Walkthrough and tagged MINImax Tinyverse Cheats, MINImax Tinyverse Gameplay, MINImax Tinyverse Guide, MINImax Tinyverse Strategy, MINImax Tinyverse Tutorial, MINImax Tinyverse Walkthrough by Marvin. Bookmark the permalink.